The Dell XPS 13 2-in-1 is a beautifully crafted performer and is one of the best productivity convertibles that money can buy. Dell’s range of XPS series notebooks are renowned for their exceptional build quality, lightness as well as their exquisitely thin bezels that allow for larger displays than what their chassis would ostensibly be able to mount. Their latest convertible variant, the Dell XPS 13 2-in-1 bears all the hallmarks of its illustrious forebears and has a few nifty tricks of its own thrown into the bargain. 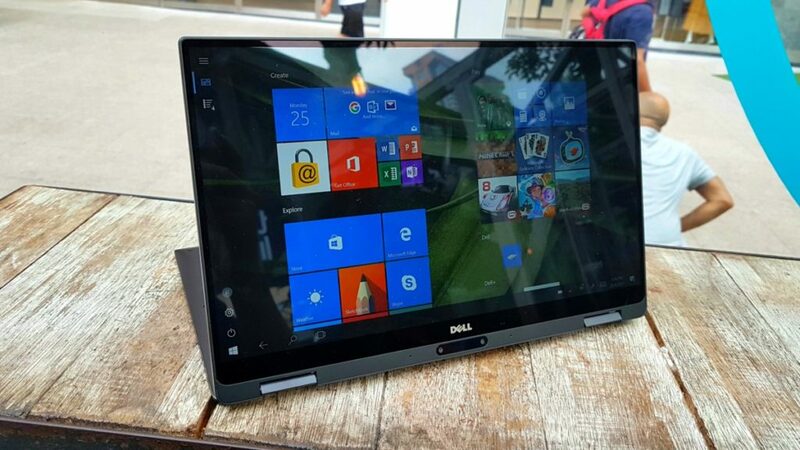 The Dell XPS 13 2-in-1 incorporates a 13.3-inch Full HD touchscreen display into a hybrid form factor that lets you turn it into a notebook or a tablet. The key to making this happen are the robustly machined double hinges. Like its other siblings, the XPS 13 2-in-1 is hewn from light carbon fiber to keep the weight down where possible while having an aluminium top lid and base. The top lid is matte black with silver trim on the edges and is otherwise unadorned save for the Dell logo emblazoned in the middle. Flipping it open reveals a delightfully crisp touchscreen that has a bezel that measures just 0.2 inches all around. This allows Dell to cram in a 13.3-inch Full HD display into the equivalent of an 11-inch chassis which is quite a feat of engineering. There’s no flex or play in the top lid and the robustly built 360-degree hinges on the notebook have no wobbling so the screen stays in place where you want it to. 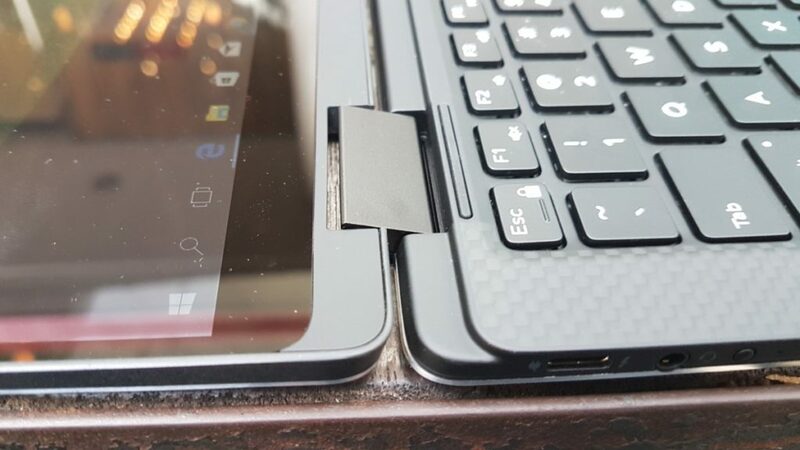 The sturdiness of the hinges also means that the XPS 13 2-in-1 can be deployed in one of two other different modes on top of the usual laptop and tablet form factors. The other two modes include deploying it like a display by propping it up like a tent and also keyboard face down as a base. The built-in accelerometer adjusts the screen orientation accordingly. The right side sports a power button, a microSD card reader and a USB Type-C 3.1 port. Unfortunately, the power button is tiny and it’s recessed a fair bit into the side so you’ll need to give it a firm push to turn it on. A toggle or a slider would have been welcome but it’s understandable from an engineering standpoint to make sure it won’t inadvertently turn itself on by accident when it’s tossing about in your backpack. The left side of the notebook notably comes with a Thunderbolt 3 port and an audio jack. This dearth of conventionally sized USB ports and other inputs means that you’ll need to rely on an adaptor or other alternatives if you want to read data off a flash drive or other device or if you’re using more archaic (read: older) inputs to port out a feed to another monitor. Fortunately, it comes with a Type-C to USB dongle out of the box. 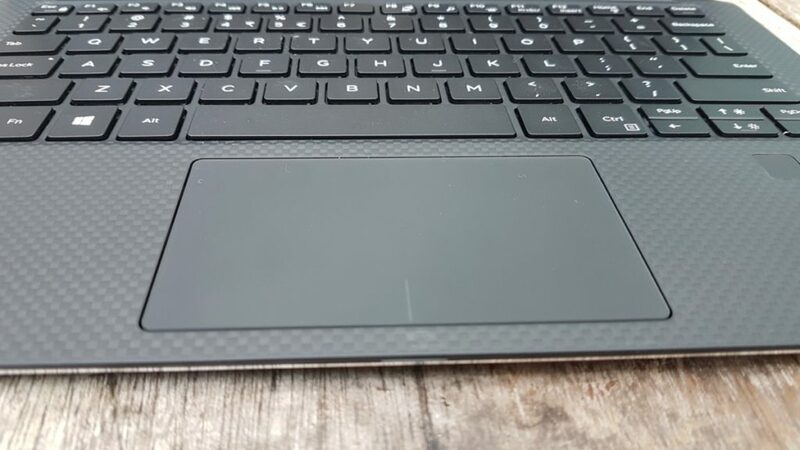 The underside of the XPS 13-in-1 has two raised rubberised strips running lengthwise along the chassis that keep it in place when plonked on a table. 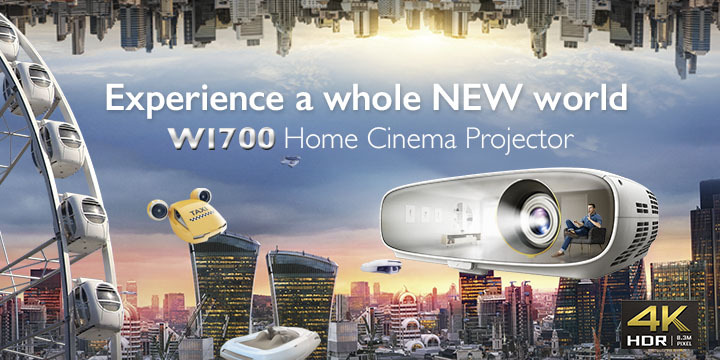 It also manages to integrate two compact side-mounted speakers placed along its sides. Befitting its intended purpose as a productivity rig, the notebook sports a chiclet-style backlit keyboard that has a set of direction keys along with a large, responsive touchpad. The palm rests come with a unique textured finish that repels fingerprints and it also sports a fingerprint reader as the notebook supports Windows Hello authentication. With the lid down, the XPS 13 2-in-1 strikes a classy, distinguished looking silhouette and holding it in your hands gives you an appreciation as to the craftsmanship that went into it. Unfortunately, it’s not able to be opened one-handed. There’s no purchase along the sides or a lip to hold onto so you’ll need to gently prise it open with both hands. 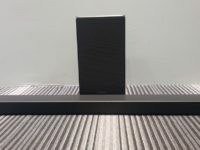 In terms of hardware, our test unit came with the entry-level configuration which sports a seventh generation Intel Core i5-7Y54 processor running Windows 10 Pro, 8GB of LPDDR3 RAM, Intel HD 615 graphics and a 256GB PCIe SSD. 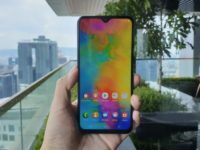 Plonk out a substantially more cash and you can opt for a configuration with a QHD+ touchscreen, 16GB of RAM, a 512GB SSD and a seventh gen Intel Core i7 processor for a princely RM7,899. For a period of several weeks, we subjected the XPS 13 2-in-1 as our primary go-to work rig and toted it around and about town. Firing it up took seconds and getting into the Windows desktop was a swift affair measured in seconds.Usage patterns varied of course depending on the day but it got a solid six plus hours of work a day without faltering and work usually consisted of Google Docs on Chrome along with several opened browsers as well as music streaming in the background. In between, it was used to stream the occasional movie or two and Youtube videos as needed. The notebook was able to handle basic photo manipulation and a modest amount of rudimentary video editing by stitching vignettes together and while it wasn’t a speed demon, it did get the job done. 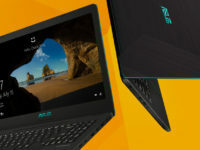 In terms of gaming, the notebook only comes with Intel integrated graphics so getting anything beyond last-gen or casual gaming would be a bit of a stretch though it handled Dungeons of Dreadmor without undue trouble. Even after several hours of use, the XPS 13 2-in-1 remained whisper silent in use and only reached a mildly warm state on the chassis even though the system is fanless which is a blessing for those who tend to use their rigs on their lap. 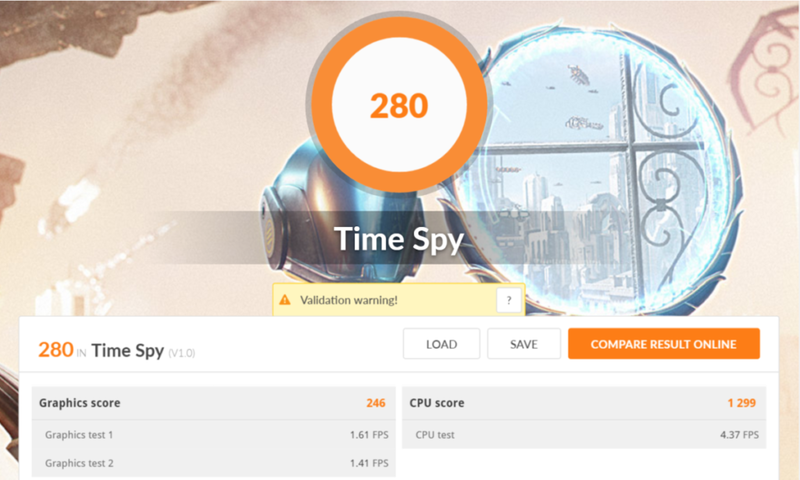 The benchmarks borne its emphasis as a productivity rig.The XPS 13 2-in-1, got a low score of 280 in the 3D Mark Time Spy demo. In PC Mark, it scored a decent 4,234 points when subjected to a standard productivity work scenario. In the Creative test which mimics a workload of a creative designer, it scored a modest 3,823 points. In GeekBench, it scored 3575 on a single-core score and a better 5,693 points on the multicore test. 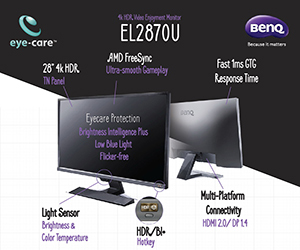 On paper, the touchscreen display has a 72% colour gamut and a contrast ratio of 1000:1. It was a delightful affair to use with beautiful colours, crisp details and excellent responsiveness. The Fifth Element’s customary vibrantly hues were well depicted onscreen with good colour saturation while the likes of the Dark Knight Return’s deep blacks were given due justice. 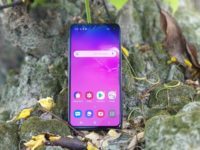 Unfortunately, it’s also somewhat of a fingerprint magnet and was rather reflective on account of the finish which makes using it in certain lighting scenarios somewhat of a challenge. That aside, this remains one of the best displays we’ve seen. The two side-firing speakers made for a good showing with with excellent clarity and good detail despite their small size which makes the XPS 13 2-in-1 a surprisingly competent (and portable) movie watching rig. The keyboard itself is offered exceptional tactility and good key travel, striking a pleasant balance between the needs of light-fingered touch typists and more forceful button pushers; we’re more of the former. The backlighting helped when working in low light and typing out reams of text was a very pleasant experience with minimal mechanical errors even when typing at speed. Touchpads on notebooks are often an afterthought with clunky responsiveness but the XPS 13 2-in-1’s touchpad not only proved pleasantly responsive, it also lent itself to smooth, intuitive usage of pinch zooming and other multitouch gestures in lieu of using the touchscreen. In terms of usage, we got the most out of the traditional laptop style for work and the tent-style display mode for presentations or movie watching sessions. Tablet mode and display mode saw less use with the former lending itself to the more artistically inclined when paired with an optional stylus. With the aforementioned standard usage scenarios, the XPS 13 2-in-1 was a trouper with a good eight plus hours of usage on a full charge before we needed to find a plug point. Your mileage will vary of course but if you are generally using this to sort your paperwork for the most part on a daily basis, it will have sufficient endurance to last you through your average work day. The combination of an vibrant, large-sized display and a responsive keyboard and touchpad in a highly compact 11-inch sized form factor also makes toting it about and working on it a real joy in the field. The lack of an integrated full sized USB port is understandable though having to carry a dongle around was an added logistical burden. 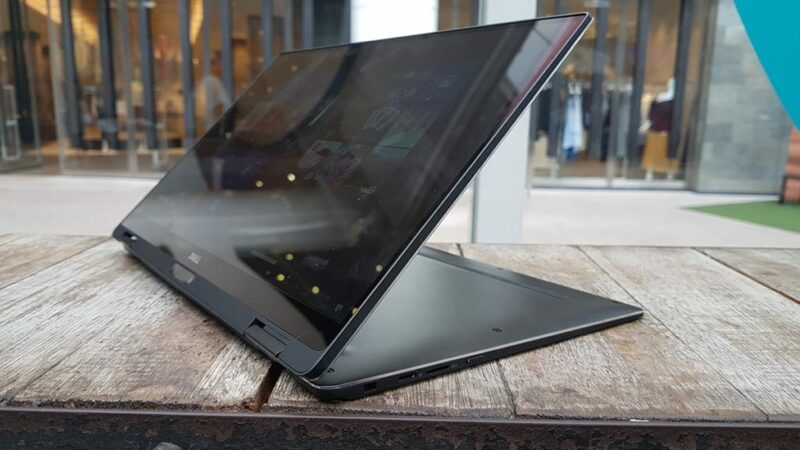 The entry level Dell XPS 13 2-in-1 configuration that we tested is a beautifully built and highly capable offering as mobile productivity rigs go but if you have the cash to spare, chunk out for the top-end model with the QHD+ display, larger SSD and i7 processor. The Dell XPS 13 2-in-1 is a beautifully crafted performer and is one of the best productivity convertibles that money can buy.